It may have been named after Charles, the Second Earl of Grey (and I’m a big fan of his tea), but there is absolutely nothing ‘grey’ about Ontario’s Grey County – a fact that Henk and I discovered when we were invited by Grey County Tourism to photograph the region’s emerging fall colours this past week. 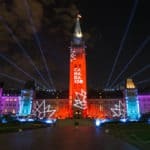 What we learned is that this part of the province is not just a premier location for viewing autumn colours, it is also a vibrant destination for fine food, culture and all kinds of grownup fun. But first…the colours! Even for comfort-loving outdoor enthusiasts like myself (think ‘glamping’, not ‘camping’! 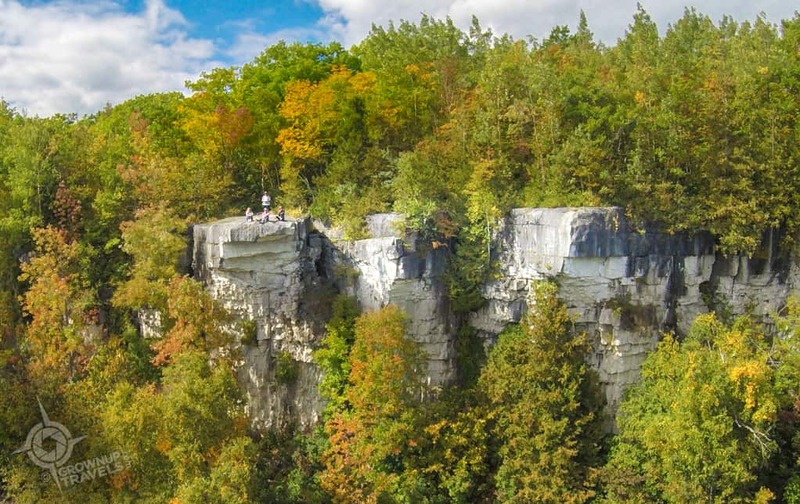 ), fall is definitely the time of year that inspires me to go hiking, and with the Niagara Escarpment running through Grey County, there are some pretty impressive stretches of the Bruce Trail here to explore. One of these takes you to Skinners Bluff, a spectacular vantage point just north of Wiarton that offers panoramic views out over Georgian Bay and a great place to enjoy an above-the-trees view of the colourful countryside. 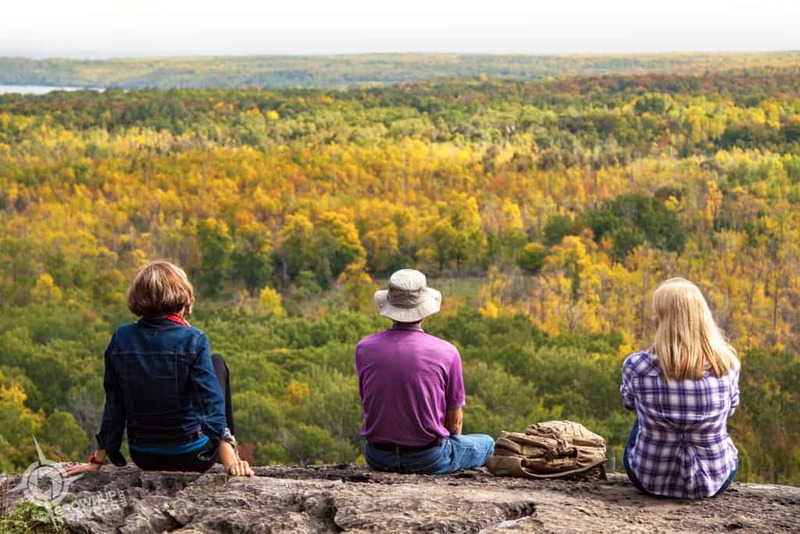 Bring a lunch on your hike to Skinners Bluff and enjoy the fall colours from these front-row seats! Henk and I had a taste of what it was like to be above the trees from our Georgian Bluffs lookout, but we had the chance to actually walk above them in the Blue Mountains thanks to Scenic Caves Nature Adventures, who lay claim to Southern Ontario’s longest suspension foot bridge. 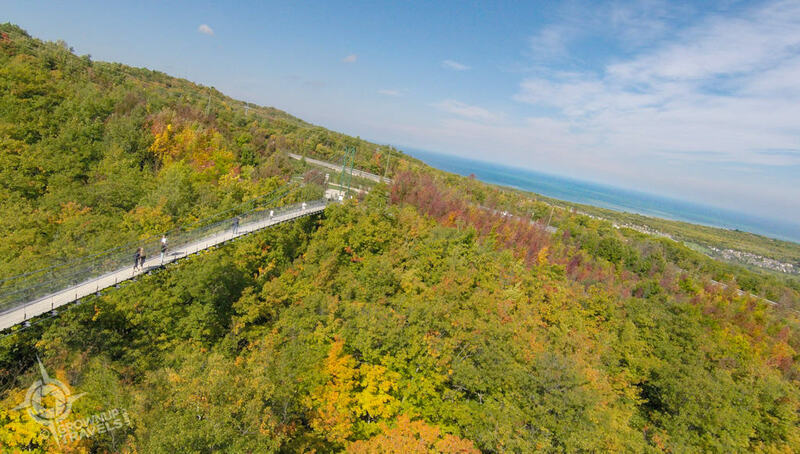 At 420 feet long, this sliver of engineering allows you to stroll 25 meters above the ground at the top of the escarpment, looking down on the changing colours of the trees below. But it’s the view out over Georgian Bay and Collingwood that is the real showstopper here, and even though the colours were just starting, our vantage point 300 metres above the lake made for a stunning view. 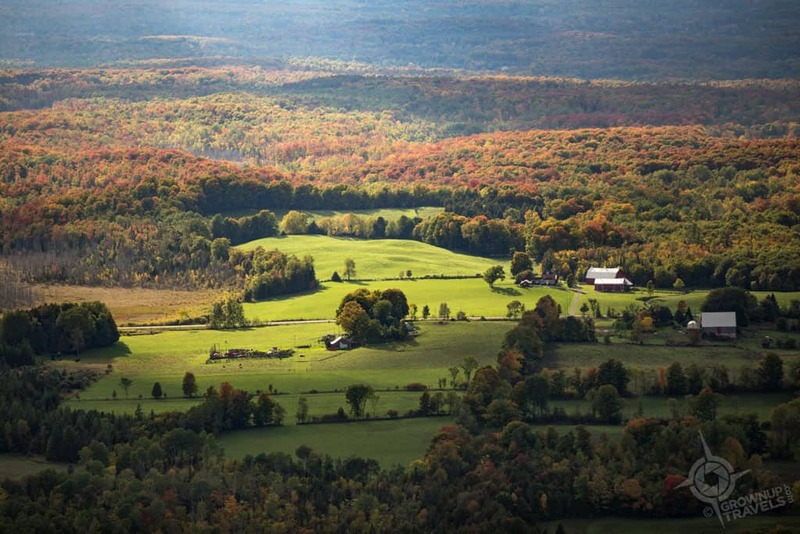 Hiking the trails or driving along Grey County’s backroads are excellent options for enjoying the fall colours, and the views from the suspension bridge were incredible, but when it comes to the most exciting way to view the fall colours, nothing beats seeing autumn colours from the air. Yes, that’s the wheel of the plane with Grey County below! 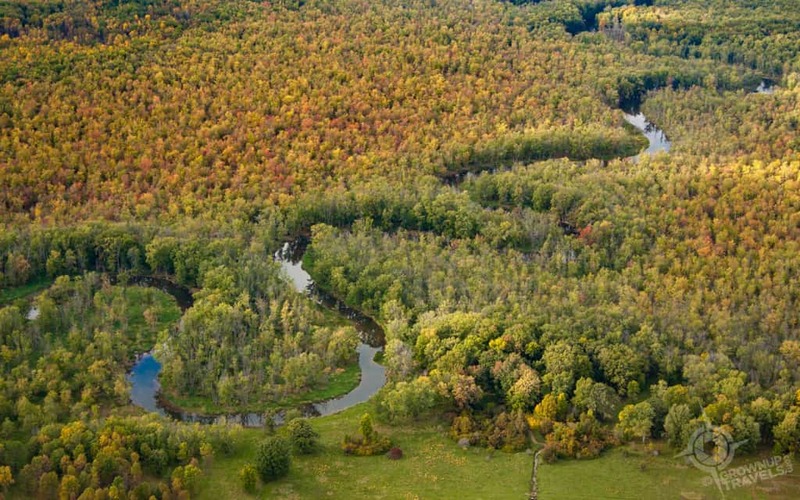 Luckily for us, Owen Sound Flight Services offers a number of popular sightseeing tours that take passengers over Beaver Valley to view the changing colours, and they’ll even customize your flight if you want to see something specific. Spotlit farm fields and dramatic shadows on our dusk flight. Our flight took off just before dusk, and with the late afternoon sun casting long shadows on the rural countryside, the views were simply breathtaking! 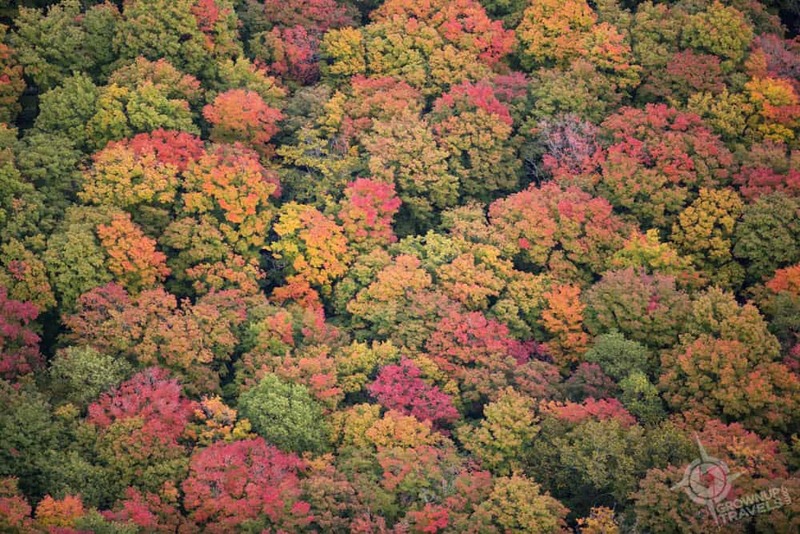 Looking down on the colourful treetops gave us a truly unique perspective and some incredible photos. And for those of you who remember that aerial view of the waterfall from the original Jurassic Park movie, there was even a flyby of beautiful Eugenia Falls! Truly spectacular. 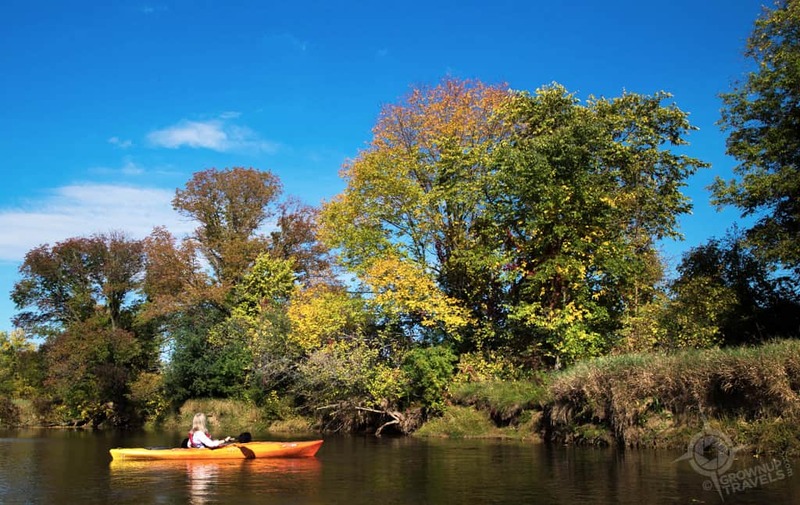 The best part about these tours is that the guides actually drive you upriver to where you launch, so the whole trip is downriver, making it feel almost effortless. Floating around the bends of the river with our bright red and yellow kayaks contrasting the deep blue autumn sky, Henk and I felt like we were actually contributing to the colourful landscape ourselves. 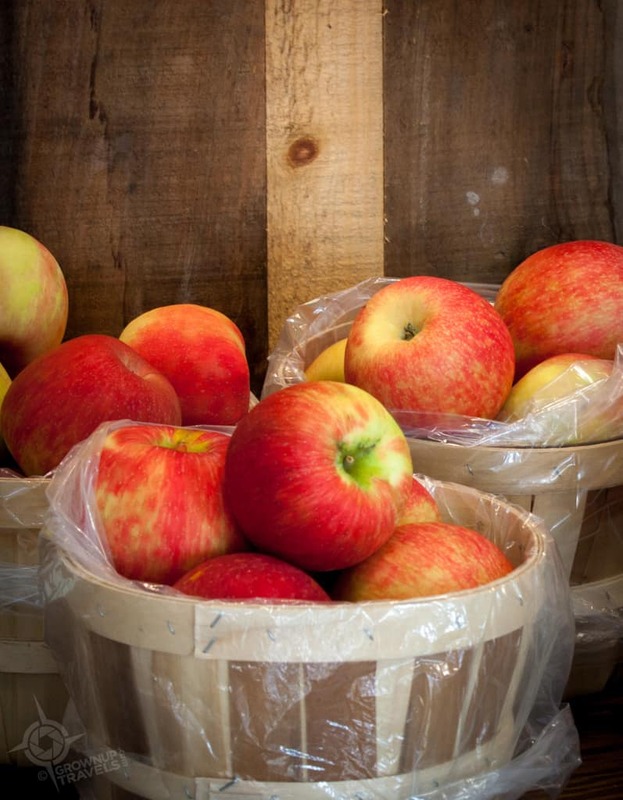 Grey County boasts a full palette of colours when it comes to its natural landscapes, but its fall bounty doesn’t end here: there are also plenty of local products to tempt your palate – from field-ripened fruit and vegetables to fresh ciders and local wine. 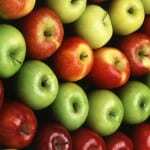 It came as a surprise to learn that Grey County is the largest apple producing region in Ontario, but what was even more surprising was the innovative growing technique we found at T&K Ferri orchards in Clarksburg. 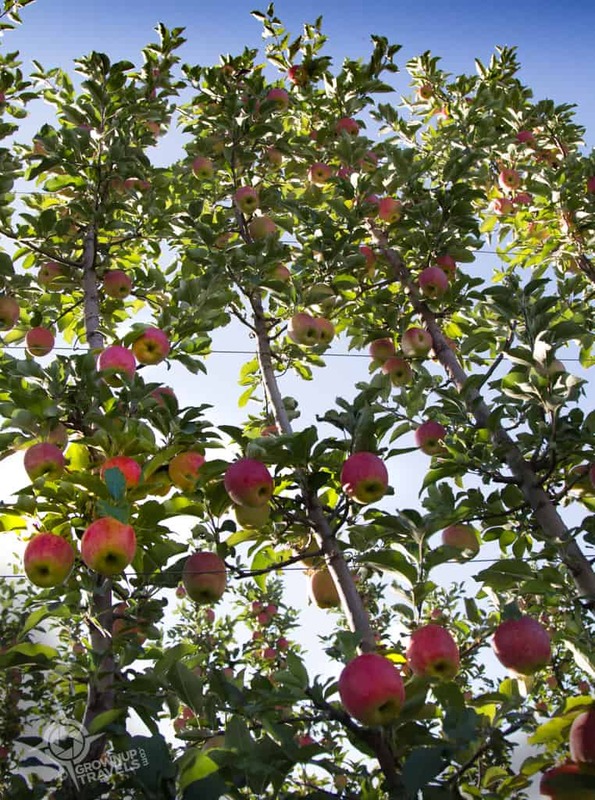 Here, owners Tom and Karen Ferri are using an Italian technique to develop high-density orchards where closely-planted trees grow vertically on what are called “Super Spindles”. Coffin Ridge is the perfect place for a fall sundowner! 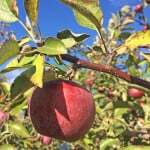 And with all those local apples just begging to be fermented, there’s no shortage of hard ciders being produced in Grey County as well. 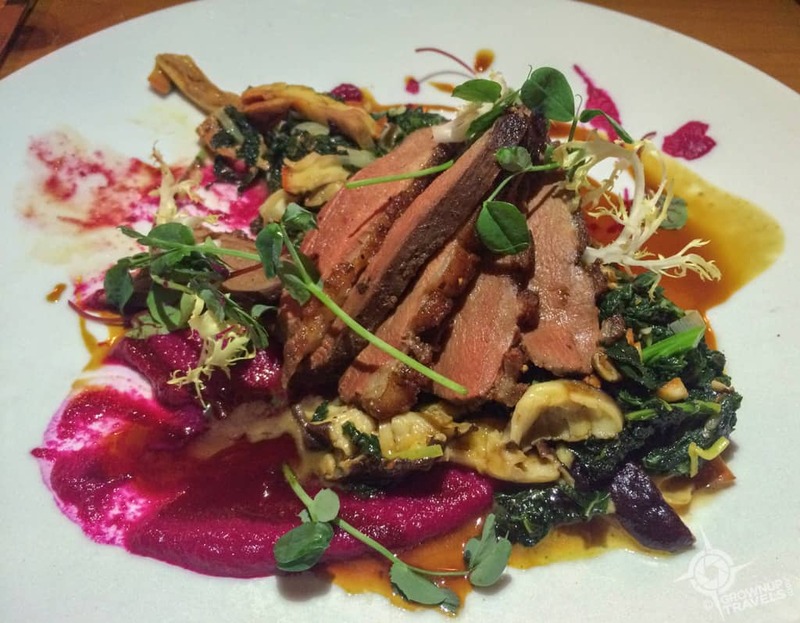 With its abundance of local growers and farmers, Grey County has become quite the destination for foodies and locavores, and you don’t have to go far to enjoy top-notch dining. Several award-winning Canadian chefs call Grey County their home, raising the bar for the entire region and inspiring creativity and authenticity in other young restauranteurs. Henk and I met one of these, Beth Milne, who along with chef partner Emily, operate Casera Kitchen Table in Owen Sound. Most of the quirky Mexican decor has been provided by local patrons. 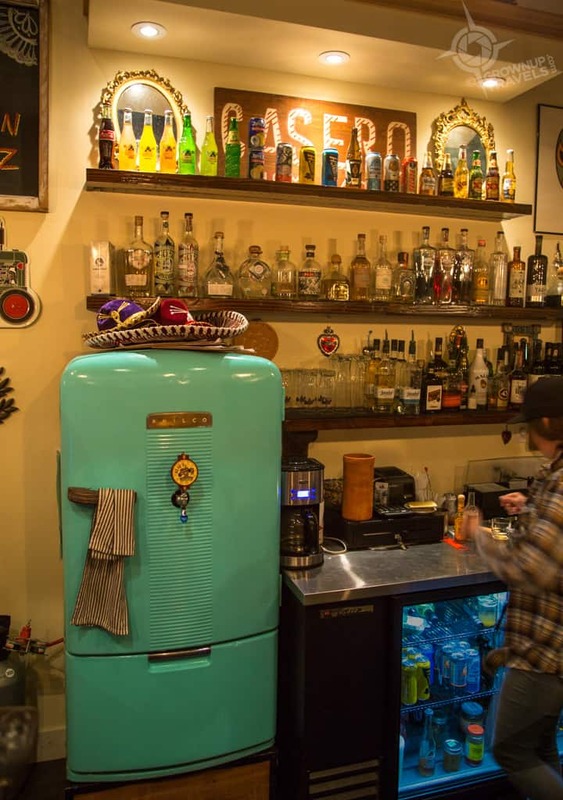 Beth and Emily started out with a double-decker ‘food bus’ in Sauble Beach which was so wildly successful they opened a bricks-and-mortar location in Owen Sound, bringing delicious and locally-infused authentic Mexican cuisine to the area. If you think creative Mexican food would be a hard sell here, just look at the lineups waiting to get in. 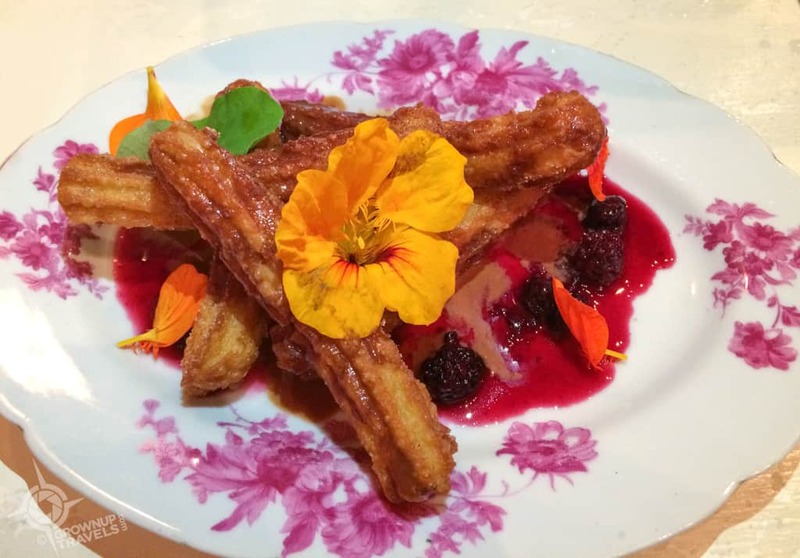 Shaun Edmonstone is another chef who has brought his talents back to his hometown, this time in Thornbury at the Bruce Wine Bar, where his commitment to using locally-sourced ingredients has earned the restaurant a FeastON designation. I love it when I have a meal that is so good that no one thing is the ‘hero’ on the plate because everything is equally delicious, and both Henk and I can say that our duck and pickerel choices were stellar. And with field-ripened ingredients sourced from Edmonstone’s own back yard, our plates were as colourful as the surrounding countryside. Fall colours may be fleeting in Grey County, so if you want to capture them in all their glory, now is definitely the time to go. 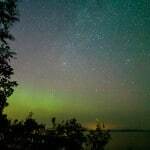 But it is the wealth of other attractions here that make Grey County a four-season destination and one you’ll want to return to again and again. I know Henk and I will! 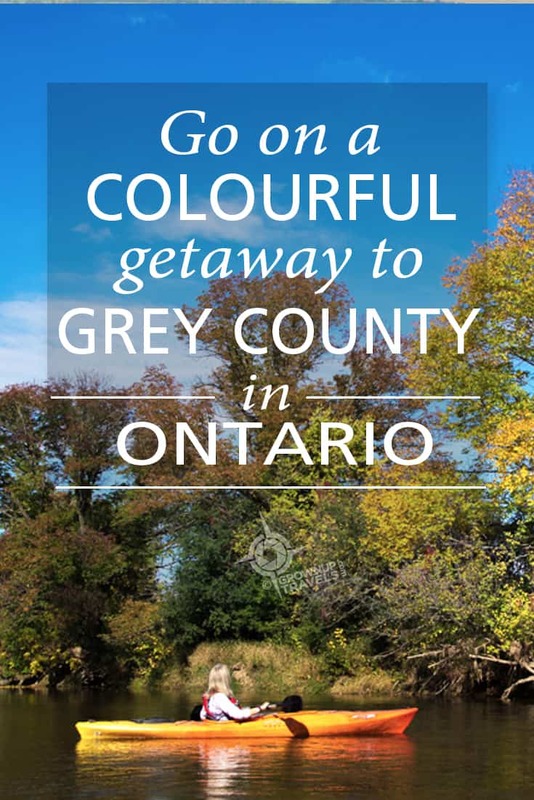 Special thanks to Grey County Tourism who hosted our Grey County getaway and introduced us to these colourful ways to explore the region. Oh my goodness! 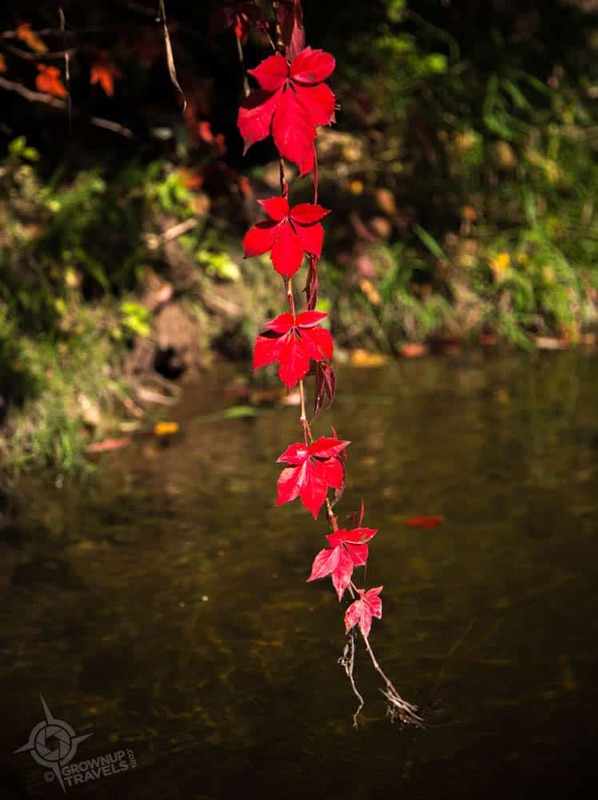 Some of the most beautiful fall foliage photos I have seen this year!! Awesome! Living in Texas I miss all the splendor of autumn. I’ve always said that if I lived where we didn’t have all four seasons, I know I would miss them, and even though fall can be fleeting, I would definitely miss the colours! Grey County is such a beautiful part of Ontario, especially in the fall. Thanks for bringing us back if only for a moment. My pleasure, Nathalie. It was absolutely beautiful when we were there, not just for the colours, but also for the never-ending summer weather! My husbands family is from the Georgian Bay area and it is indeed gorgeous most anytime of year. You’ve captured it beautifully, and although it might indeed be a bit grey in the dead of winter, there is still much to appreciate in the scenery. You’ve made me miss it…. Thank you, Alison – I’m glad we could give you a glimpse of what Georgian Bay looks like this time of year. The area really is changing (and not just the colours!) 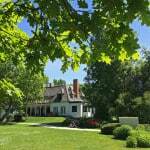 with new restaurants and a lot of interest from ex-pat Torontonians looking for an escape. Thanks, Debbra. It certainly did give us a different perspective, especially since the trees were changing top-down. 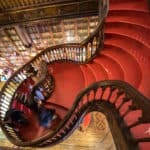 Jane – great post – I really want to go! I think the colours will be peaking this weekend, so if you’re thinking of a road trip, that would be the time! Hooray! 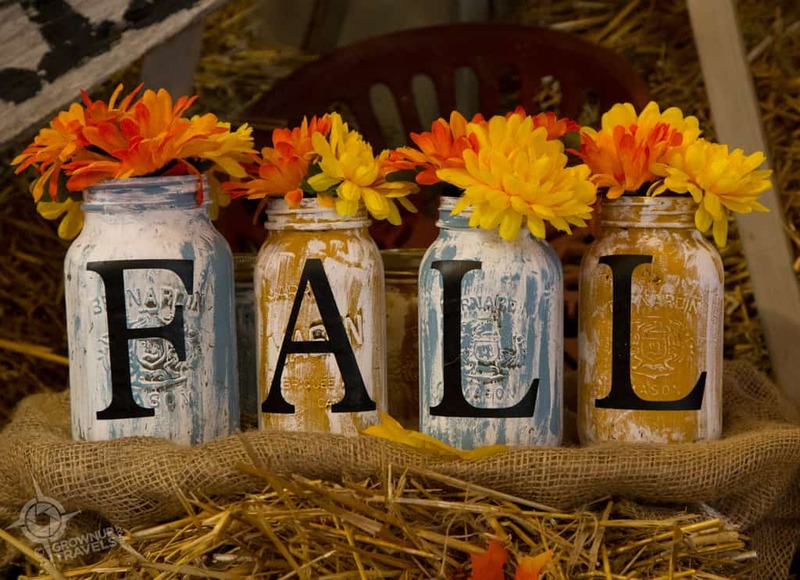 A new fall foliage destination to add to my travel wish list. 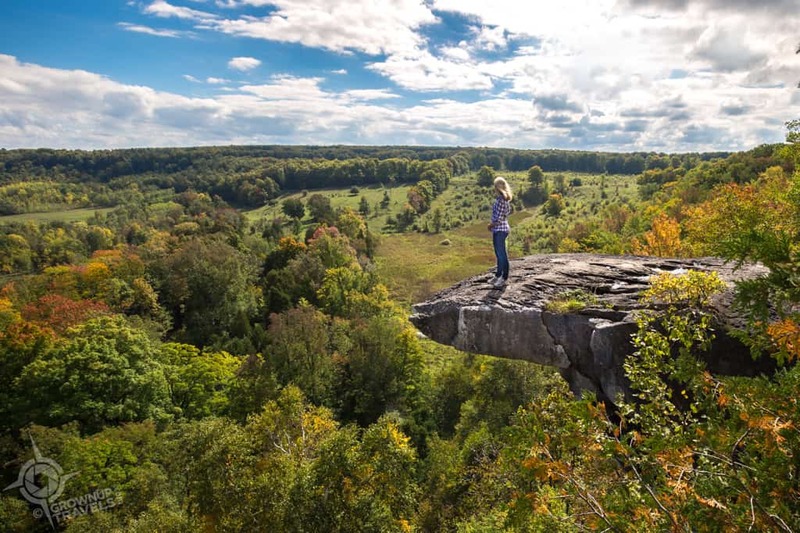 Grey County Ontario looks absolutely gorgeous, and that Skimmer’s Bluff Lookout is calling to me. 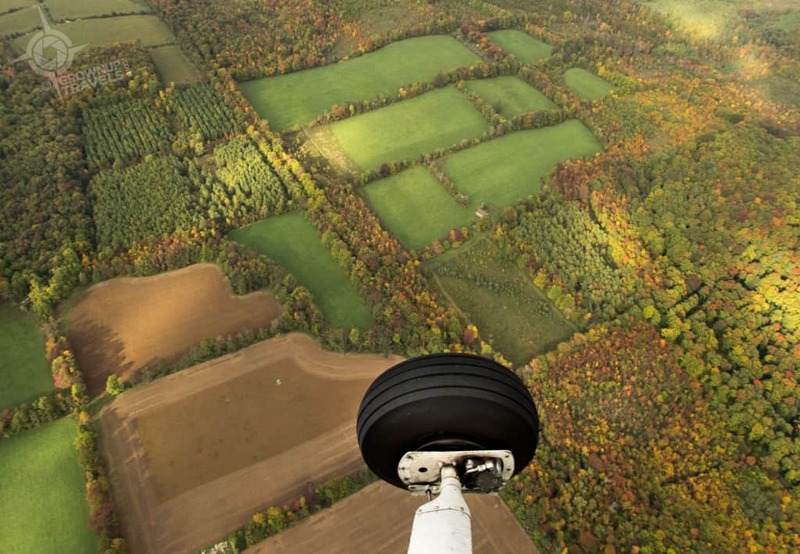 The scenic flight looks like the perfect way to take in the fall colors! 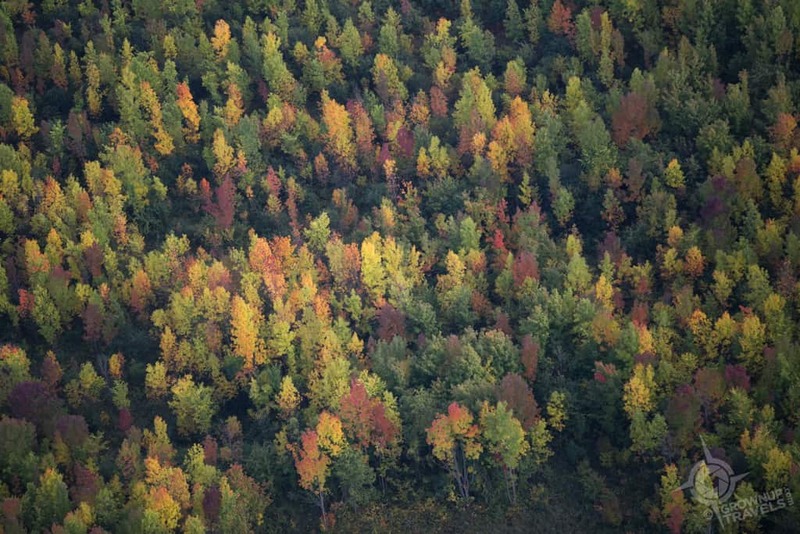 I’d definitely recommend the flight – it was really quite affordable, and I’m sure people from far-flung places would make seeing North America’s autumn colours from a plane part of their bucket list. 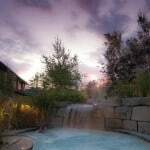 We’re lucky that we have these destinations in our own backyard to enjoy, so why not spoil ourselves! The picture itself speaks how beautiful Grey County is. Love the fall colours too. 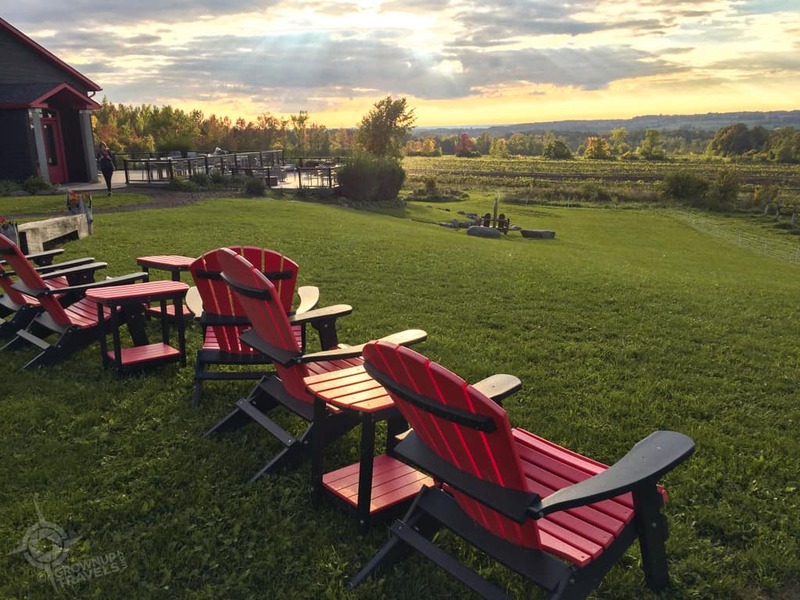 Photos really don’t do Grey County justice at this time of year – the colours are getting even better every day, so we would love to go back and capture more! That’s interesting. I hope you’ll capture a lot. Thanks. Oh, you’re making me hungry and a little homesick at the same time. I grew up with those views and those apples. 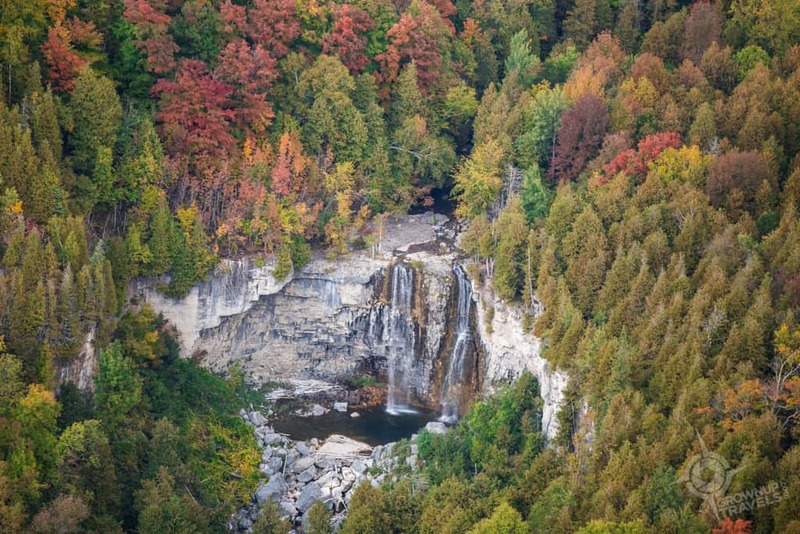 Seeing Eugenia Falls and the Niagara Escarpment from the plane must have been such a thrill – the pictures are gorgeous. There is such a lot of beauty in Canada. We have much to be grateful for, this Thanksgiving Day and all year round. Thanks for posting about Grey County. Really enjoyed it. So nice to hear from someone who knows the area, Jill. You definitely have a great place to call home, and you’re absolutely right – the views from the plane were something else! Love the fall colours! Ontario is indeed a province that allows us to enjoy everyone one of the seasons in a big way. Thx for introducing us to Grey County. It was something of a re-introduction to me, too, Doreen. This is becoming Toronto’s playground for many people who want to escape the city and move somewhere less stressful – I can see why. 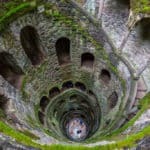 A treat for you, and your readers! Thank you, Shila! We had so much fun shooting the photos – and the weather was stellar!